Why is the sky blue and the grass green? What are the colorful secrets of the enigmatic aurora borealis or the ethereal shimmer of a soap bubble? 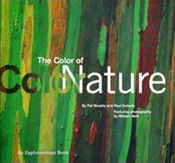 From San Francisco's Exploratorium, the acclaimed hands-on museum, comes The Color of Nature, which delves into these and other intriguing questions. Extraordinary photographs by William Neill and other noted photographers, along with engaging text, illustrate the fascinating phenomena behind the myriad colors that make up our world--from lunar rainbows to mandrills, chameleons to hydrangeas. This remarkable volume will fire the imagination of anyone with a passion for nature, science or photography.